You insist on scouting two to three weeks before the opener. Bucks 3-1/2 years of age or older are tough to hunt. The average hunter only succeeds in taking one or two in 30 years of hunting. It's not because there are few deer of this class. In most hunting areas, roughly 40 percent of deer are antlered bucks and living in practically every square-mile of suitable habitat there are three or more that most hunters would rush to the taxidermist. The problem is we humans tend to stick to traditional hunting methods — methods most experienced adult whitetails have learned to effectively deal with. This is why most deer taken by average hunters are fawns and yearlings, inexperienced deer not yet adept at recognizing and avoiding trails, sites and hunting ploys customarily used by human hunters. Our experienced adult deer, especially older bucks, are actually becoming more and more elusive. One big reason is, ever since North Americans began hunting whitetails with guns, we've been culling deer likely to fall victim to our favorite old hunting methods. Today about half of our whitetails are killed annually, most by hunters, but many by motor vehicles, poachers and severe winter weather. Those we fail to harvest are the far less vulnerable deer and they do all the breeding, passing on increasingly superior genetics to each new generation of whitetails. Though today's average hunters are skilled enough to keep whitetails from becoming overabundant, trophy-class bucks continue to keep four or five steps ahead of them. By no means does this mean we humans cannot become fairly successful at hunting those dream bucks pictured on calendars and paintings (3-1/2 to 6-1/2-year-olds, few surviving past age seven). As my sons and I have proven since 1990 (in a wolf infested area where deer numbers have rarely exceeded eight per square mile), it is possible for a skilled and determined hunter to take six to ten mature bucks in ten successive hunting seasons (see www.drnordbergondeerhunting.com). Late in seasons when sightings of older bucks were fewer than expected, we have occasionally settled for 2-1/2-year-old and even a yearling, mostly because we cannot bear to endure a year without grilled Polish venison sausages. Most seasons we only watch such bucks pass, anticipating hunting them in future years. What does it take to enjoy buck hunting like this? It takes dedication, accurate buck lore and new and improved hunting methods. Let's begin with dedication. To be a regularly successful buck hunter there are lots of things to be dedicated about. Being dedicated means you absolutely won't do it any other way. No one can talk you out of what you are doing. Others might think you are nuts, like when you set the alarm for four in the morning, hike a mile or more in the woods in total darkness or sit in one place, hardly moving, four to six hours at a time whatever the weather. But you do it anyway. The list of things to be dedicated about begins with stand hunting. You can't be a still-hunter or a member of gang that makes drives. You can't be a hunter who wanders from dark to dark. You are a bona fide buck hunter only while sitting still at ground level or in an elevated stand. Especially while within a mile of stand sites, you travel on foot only, and never use sounds and odors of motorized vehicles to warn quarries you are coming. 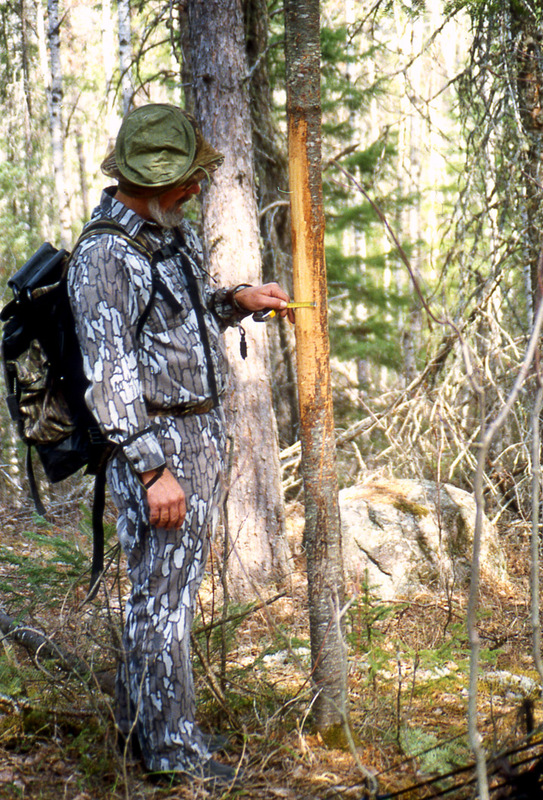 Doc measuring a very large antler rub. You insist on scouting no less than two to three weeks before a hunting season begins, knowing scouting a week or less before the opener upsets buck habits and behavior, even causing some or all older bucks to abandon their ranges for one or two weeks or more. You insist on locating one or two stand sites with good reasons for their selections for each day you plan to hunt, knowing experienced adult bucks quickly identify and begin avoiding currently used stand sites, usually without the hunter's knowledge. Selecting one stand site and sticking to it for an entire hunting season cannot make you a regularly successful buck hunter. You insist on sitting downwind or crosswind of where you expect to see an approaching buck, never relying on stand height to hide your telltale silhouette or gimmicks or potions claimed to or eliminate human odors. A stand site is only as good as its approach trail. A stand cannot be productive if deer in the vicinity readily smell or clearly see an approaching hunter. You therefore insist on approaching from downwind or crosswind via dense cover, never crossing a feeding area or large opening to get there. Whether seated on a portable stool on the ground or on the seat of a portable stand in a tree, you insist on having fairly solid, natural (unaltered) cover behind you to mask movements when preparing to fire your gun or bow. You insist on hunting far from other hunters, selecting stand sites 1/2-mile or more from roads and trails that provide easy access to other hunters using motorized vehicles. You insist on getting to your stand site 30 minutes before first light in the morning because the best hour of the day for taking a trophy-class buck begins 30 minutes before sunrise. You sit still until about 11 a.m., in the morning and from mid-afternoon until dark in the evening or all day when the type of weather that triggers midday feeding is in progress. You insist on wearing clothing that enables you to sit comfortably long hours whatever the weather. If necessary, you carry your coat in a backpack and open zippers of quilted pants to prevent over-heating and perspiration while hiking. 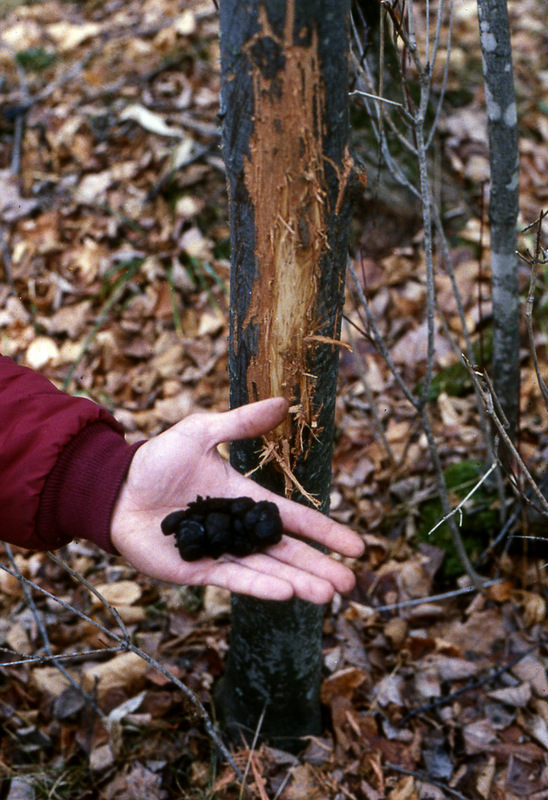 You insist on walking properly, picking up your feet (bending your knees) and putting them down lightly while traveling to or from stand sites or while searching midday for fresh, adult-buck-sized tracks and/or droppings that indicate where you will hunt next. You do this because you know even the most cunning of whitetails will then find it difficult to identify you via your footsteps. You insist those who accompany you walk in the same manner (absolutely no foot dragging). Large fields of view are far down on you list of things you look for when selecting stand sites. You see a lot of deer, but no matter how tempting, you do not fire at them. You make it a point to sit nowhere except within easy shooting range of very recently made tracks, droppings and/or ground scrapes of big bucks. Upon becoming dedicated to all of the above, you will soon become a hunter who does not insist the so-called “buck/doe ratio” is all out of whack.